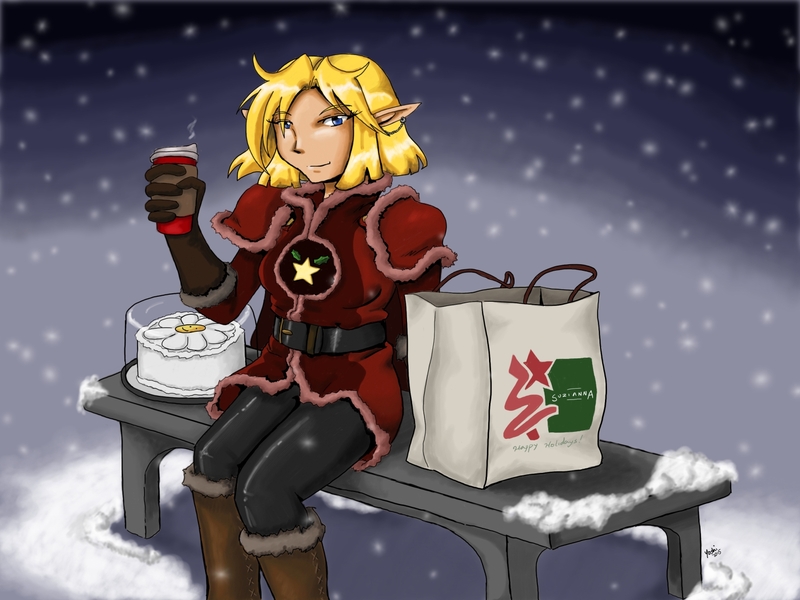 I always drink coffee after a long day of shopping! So art happened! I even streamed a couple sessions, though the second time I kept dropping my connection. And while it took quite awhile, I did finish it. The next one, despite what I said earlier, I may actually attempt to do entirely on the iPad Pro. I think part of my problem is that when I run into “oh this doesn’t work the way I’m used to” problems with those apps is that I’d sooner just shoot the file over to Blastoise rather than dig in my heels to find a workable solution where I am. I mean, I know in the big picture both units have to work together for a high-quality, well-polished piece, buuut… I DID get this thing so I can draw on it, you know? And I should actually try to DO that rather than just make a token scribble and then fall back on Blastoise since it’s more comfortable/less intimidating there. Water. Lots of water. Also a Yoshi. Art post, what? 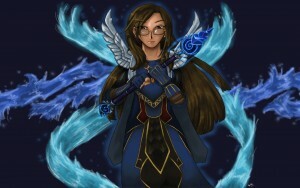 Yoshi (the human version) with the basic version of Ebonchill (the Frost Mage Artifact weapon), and lots of water. Originally, Kiros and Kestine were to appear in this as well, but I had a lot of setbacks time-wise because of repeated illness and had to drop them from the final composition. ANOTHER TIME, I suppose! This week I actually got to raid with Robert, and it was pretty effing rad! He’s already racked up 3 tier pieces and up to ilvl 691. He is also open to tagging along on the Critically Insane runs (technically alt runs for me since I’m using cow!Phil with them on a regular basis again, with Robert here and Suzi likely to return next week, Lazy Peons won’t need so much cowbell anymore. Their loss is Mr. Frailin’s gain, I suppose) to fling bonus rolls, since he still needs some pieces to fill out his gear. He’s better geared for Enhancement than Resto, of course. Let’s hope the Peons can help me sell bro on getting a headset and talking in Vent. Right now he says he can’t be bothered, but I think once he sees how nutty we are he would want to jump in and sass off with Char. Or validate my assertion that he’s voice actor material. It’s been YEARS since I’ve heard bro break out his flawless Dr. Evil voice. Don’t make me a liar, man! Yes, this is a couple weeks behind, but eh. Not that kind of Yoshi! 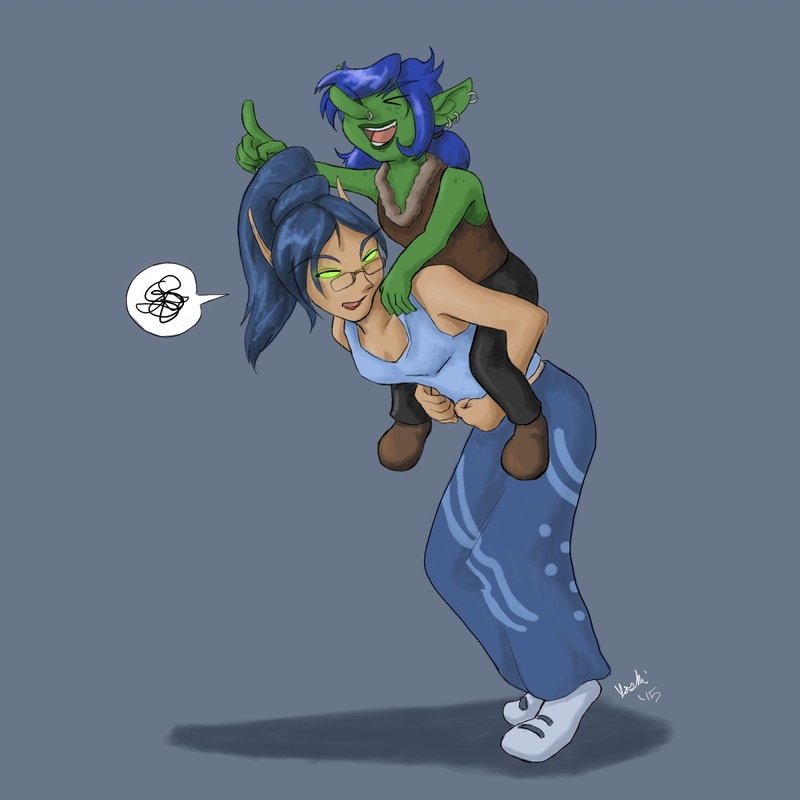 Welcome to a new subfeature of the art posts, which is supposed to get me to draw more often based on the shenanigans in my Horde guild’s raids. These are meant to value speed and punchline over being finely polished, so, uh, yeah. Also: I WISH Blood Elves could wear glasses. 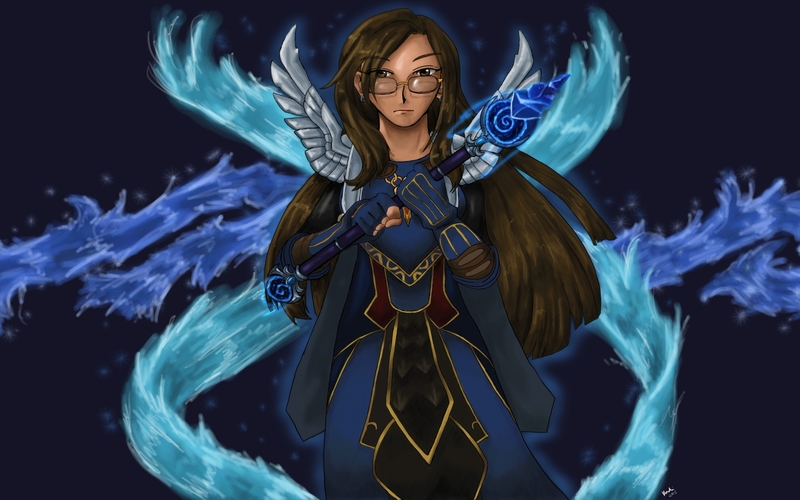 Seriously, why are glasses not a thing in WoW? Does everyone have perfect vision because of magic/fel juice/troll mojo? WTF, game! 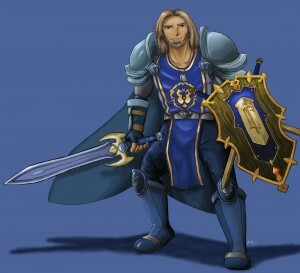 As I said before, I threw out his current transmog and just played with the design. The shoulders are a simplified recolor of the ones Admiral Taylor’s packing (which I believe are themselves a tweak of the Hunter PVP shoulders? ), but I more or less just invented the rest. 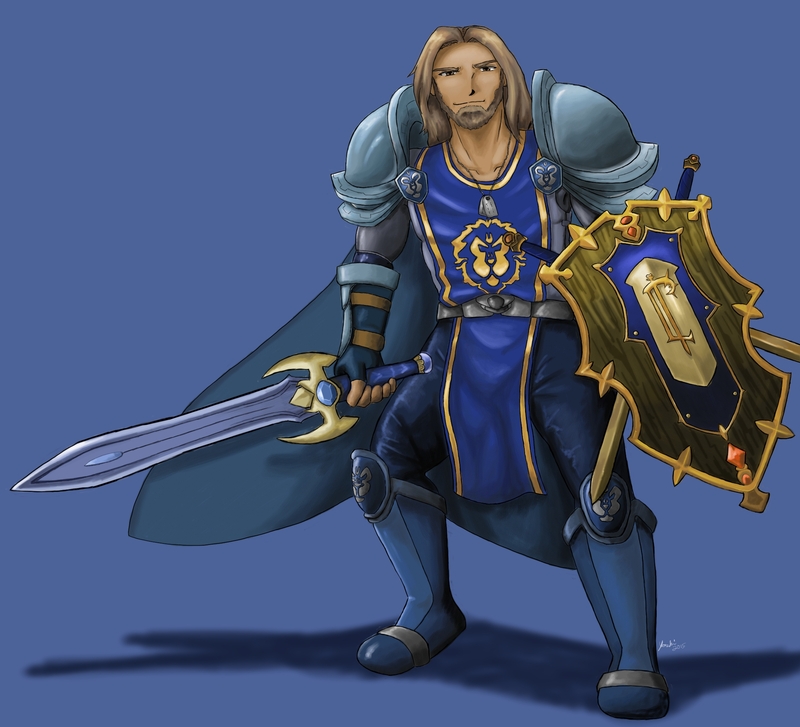 The exceptions are the sword and shield, which are clearly the Grand Marshal’s Longsword and the Royal Crest of Lordaeron. As for the video render, that will take at least a day or so to put together. Basically, Blastoise has to render one big video of all the capture sessions at its original length (over 10 hours!) before he can squish it down. The software I’m using won’t let me pre-squish the individual capture sessions, so that’s how it has to be. After the initial export is done, I’ll do the commentary track and lop off the taskbar (it’s a little distracting in preview, since Blastoise has rotating wallpapers and his taskbar is transparent) and punt the whole thing to YouTube.